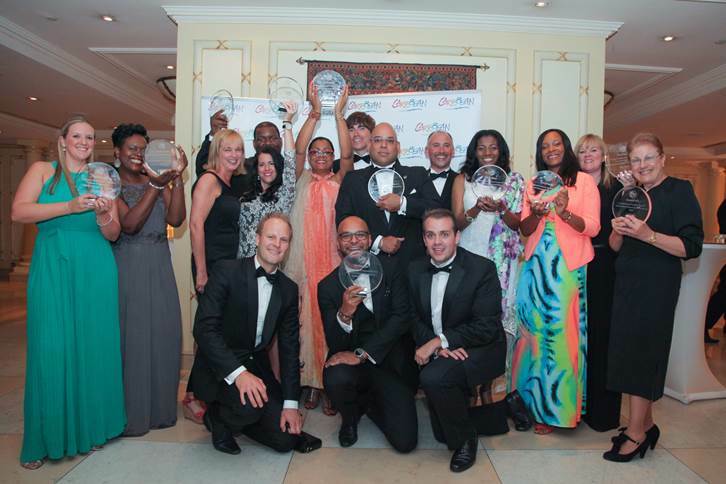 26 June 2015: Last night at The Caribbean Tourism Organization’s (CTO) silver anniversary ball, Simon Reeve UK’s best-selling author and TV personality, presented the Telegraph Caribbean Travel Awards at The Millennium Hotel, Mayfair. The UK Chapter of The Caribbean Tourism Organization teamed up with The Telegraph to launch the Caribbean Travel Award where Telegraph readers voted for the awards via the Telegraph’s website. These awards follow on from the Telegraph “Best of the Caribbean” supplement which appeared on 18 April 2015. The 10 different awards categories were: best destination for family holidays, best destination for beach holidays, best destination for nature holidays, best destination for activity and adventure holidays, best destination for heritage and culture holidays, best destinations for weddings and honeymoons, best destination for spa holidays, favourite luxury hotel, favourite boutique hotel and favourite affordable hotel. The CTO’s silver anniversary ball saw the organisation celebrate 25 years in the UK. The evening was attended by more than 270 guests, comprising visiting ministers and their delegations, as well as UK Chapter members. Other key guests in addition to Simon Reeve included host of the evening, Angie Greaves radio presenter at Magic 105.4 FM.